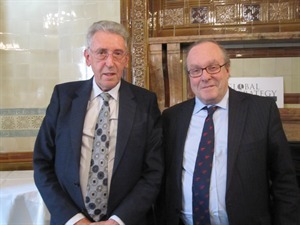 The Rt Hon Lord Howell of Guildford delivered the third of our October lectures on 30th October at a very well-attended lunchtime event chaired by Lord Lothian. In his lecture, ‘Repositioning Britain In An Age Of Austerity: Are We Finding A Role At Last?‘, David Howell argued that Britain’s EU policy should focus on reform of the EU as a whole: that in entering the new global pattern of markets and economic growth the Commonwealth offers ‘a highly advantageous route’, and that a new Commonwealth Charter, or ‘global Magna Carta’ is under construction which should be validated by Parliament when it is ready. We should spend more time, he concluded, with our (Commonwealth) family. To read Lord Howell’s lecture, please click here.